Back in 1965, not long after the 1964 Great Alaska Earthquake, when I first began working at KTVA channel 11 in Anchorage, one of the first on-camera staff that I came to know was a man known on the air as Bill Kelley. Bill's real name was William Hickinbotham and he was in the Airforce and stationed at Elmendorf. At that time, Bill was doing the sports and weather on channel 11's 6:00 0'clock news. One afternoon when I came to work, Bill introduced me to his sports guest that evening, World Heavyweight Boxing Champion from 1952 to 1956, Rocky Marciano. When I shook Rocky's hand as Bill introduced me to him, I have to admit to being a bit star struck because I had heard about Rocky Marciano as a boy growing up, and he was one of the first celebrities I met when I started working at KTVA. Later, when Rocky came on the sports set and Bill started interviewing him live, Rocky kept calling Bill "Mike" because he remembered my name and forgot Bill's name. Later, Bill Kelley and I had a good laugh about that one. One of the things I remember about Bill Kelley was his sense of humor. Among my many responsibilities when setting things up in the studio for our live nightly newscast was cleaning all the old weather information off the weather map from the night before, then carefully writing all the new temperatures and the forecast for that night's show. During his live weather report, Bill would read the temperatures I had written on the map for him, then he would read the forecast. One Thursday evening, after an entire week where the sky was overcast, I decided to have some fun. So on the forecast section of the weather map I wrote "mostly Blah". I wasn't sure how Bill was going to react, but much to my happy surprise, when he read what I had written on the air, he laughed and agreed. 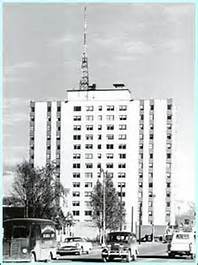 The McKinley Building had been severely damaged during the 1964 Earthquake and KTVA and KNIK-FM were the only tenants left in the building. But a new Broadcast Center was being constructed in Spenard, and we would soon be relocating our operation across town. Bill Kelley discovered a long-time musician known as "Mellow Lane". Mellow played the saxophone and still had a band. So Bill made arrangements to have Mellow Lane and his band come down to the KTVA studios in the McKinley Building where we would videotape Bill interviewing Mellow Lane and then have him and his band play a song. It would be the last thing seen on KTVA just before sign off at the old studios. I was the camera operator for Bill Kelley's production, and as Mellow Lane blew the last few notes of his song, I moved the camera right down into the bell of his saxophone. Bill loved it. After KTVA moved into the new Broadcast Center in Spenard, Bill Kelley became the 6:00 O'clock news anchor. Bill liked to have local and state politicians come down to the studio where Bill would videotape short interviews with them on current topics. Bill would then introduce the video interview segments as part of his newscast. One afternoon, Bill sat down to interview a local politician and as we were getting ready to record the interview, Bill's guest asked him "how do you vote Bill?" Without even blinking, Bill said "I vote secretly behind that little curtain". I always thought that was the perfect response. Bill Kelley was a true broadcast professional who was able to not only work in front of the camera, but was equally at home behind the camera as a producer or director. Not many people remember this, but one year they needed an on-camera host for the up-coming season of Anchorage's teen TV dance show, "The Varsity Show". You guessed it, Bill Kelley stepped up to the plate and hosted the show for a season. Always creative and willing to look at things in a new way, I remember being at the KTVA Christmas party with Bill and his family. We were all sitting around talking and Bill came up with an idea that he proposed right then and there to KTVA President Augie Hiebert. Bill told Augie that since KTVA experienced technical difficulties from time-to-time, we should invest in an aquarium filled with fish. Then, whenever we had a technical problem, we could put a camera on the fish so Anchorage viewers could watch the fish swim around while the technical difficulties were being fixed. Mr. Hiebert said "who will feed the fish?" and "who will clean the fish tank?" Bill's idea did not come to life, but I was always impressed that Bill had made the creative suggestion. Bill Kelley made an impression on this young fellow when I first started working at KTVA. I didn't realize it at the time, but I was fortunate to have Bill Kelley as one of my early mentors. Join in and write your own page! It's easy to do. How? Simply click here to return to Anchorage Radio and Television Stories.